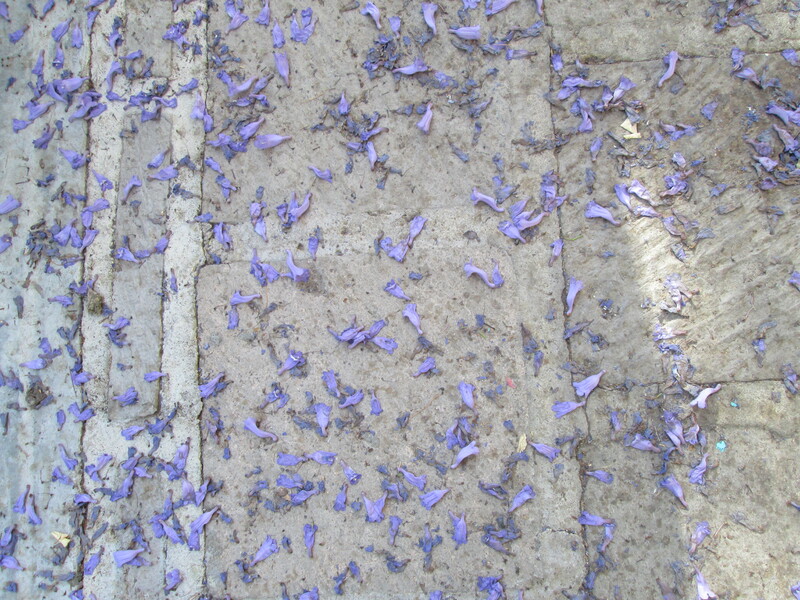 The streets of San Miguel are awash in Jacaranda petals falling from the myriad Jacaranda trees which are everywhere. 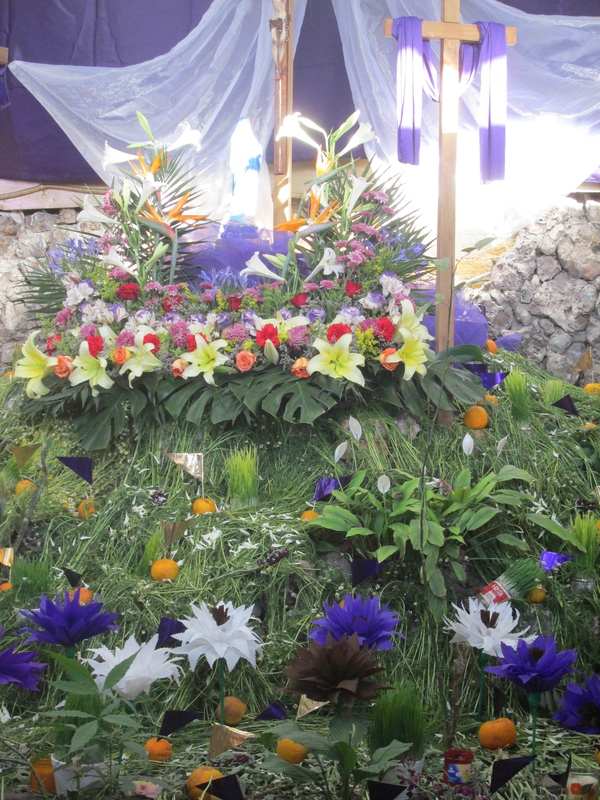 As we near the end of the “high season,” the town has been overflowing with tourists, many here for the Easter celebrations known as Semana Santa. In a few days time we will have lived in San Miguel de Allende for an entire year, having arrived from the Republic of Panama on 10 April, 2012, a few days after Easter. It was a bold move since neither of us had ever been here before — yet in the two years since we joined the estimated 6 million Americans living outside of the United States, many of our decisions could be considered bold. Some of our choices have been better than others; selecting San Miguel has been among the best. In the course of the year we have been here I have reported on many events, religious holidays and patriotic occasions. The one remaining holiday that we had yet to experience and whichI have yet to describe is Easter. In spite of the many over-the-top celebrations we have witnessed to date, nothing has compared with Easter. 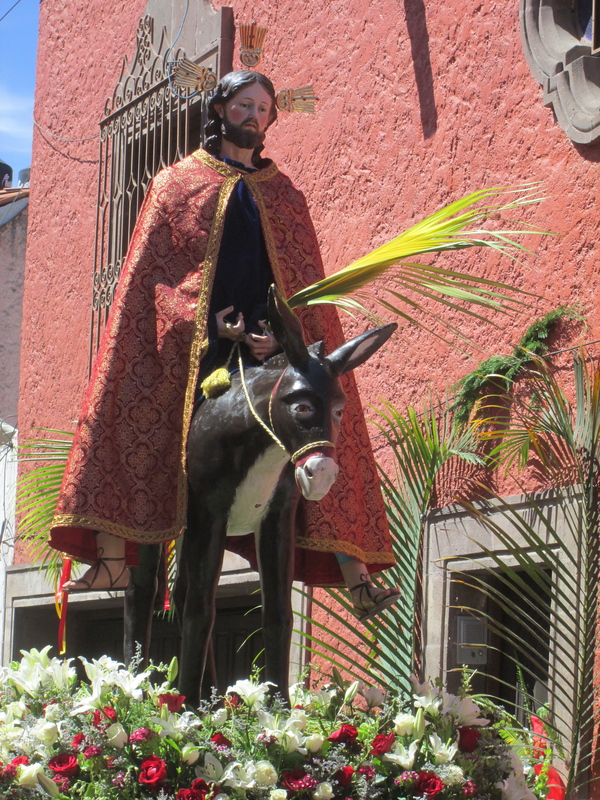 In a country know for its fiestas, San Miguel has no equal with over 50 festivals a year and the Easter celebrations are second to none. 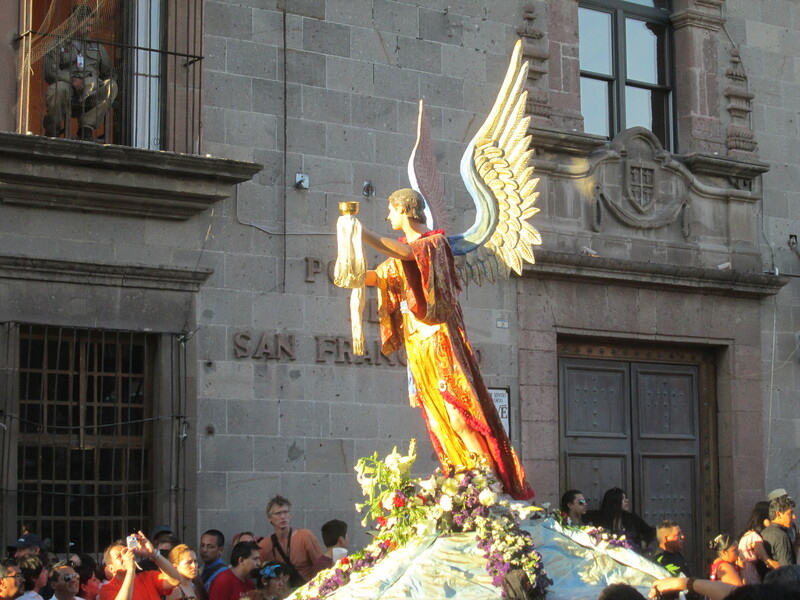 In a tradition that dates from the early 1800s, it all begins at midnight on the Sunday two weeks before Easter when a highly venerated effigy of Jesus is carried in a procession from the Santuario de Atotonilco, a World Heritage site eight miles from San Miguel, to the San Juan de Dios church a few blocks from our house. The life-sized statue portraying the flagellated Christ is accompanied by thousands of pilgrims in a slow and solemn walk through the early morning darkness with frequent stops along roadways covered in fragrant herbs — chamomile, fennel and rose petals. As the procession enters San Miguel it is greeted by fireworks and balloons and joined by increasing numbers as it nears its destination. Nine days before Easter comes the Friday of Sorrows, known as Viernes de Dolores in honor of Mary, the mother of Christ, a tradition dating from the early 1700s. Elaborate altars are set up in windows and doorways, often decorated with bitter oranges representing the tears of the Virgin, while pots of sprouting wheat represent renewal. All of the town’s public fountains are lavishly decorated with herbs and flowers along with images of the Virgin Mary. On Domingo de Ramos, Palm Sunday, red and white are the colors of the day and several different processions take place, the largest one beginning in the park and winding its way through town to the iconic parish church, La Parroquia, where Mass is celebrated. In reference to Jesus’s entry into Jerusalem, venders sell elaborately woven palm fronds for a few pesos which are held aloft by the congregation and blessed by the priests. 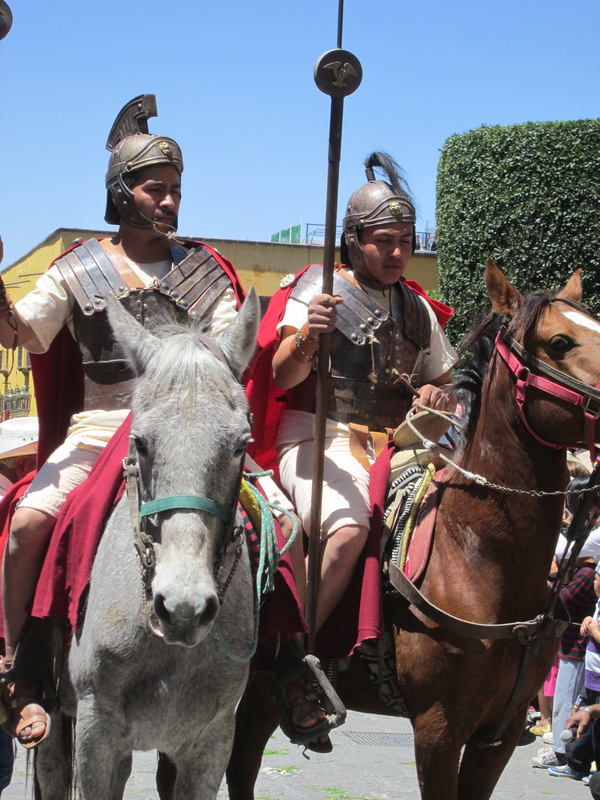 On the Monday before Easter, Lunes Santo, the arrest of Jesus is re-enacted, complete with Judas and Roman soldiers. On the Wednesday before Easter a dozen men carry the image of Jesus in a procession that stops for prayers at each of the 14 Stations of the Cross, stone niches set in walls along the route. Thursday, Jueves Santo, known as Maundy Thursday in English, is dedicated to the poor and includes a recreation of the washing of the feet of the Disciples. Most churches celebrate a Mass commemorating the Last Supper after which many of the faithful visit several churches, an Italian custom dating from the 16th century. 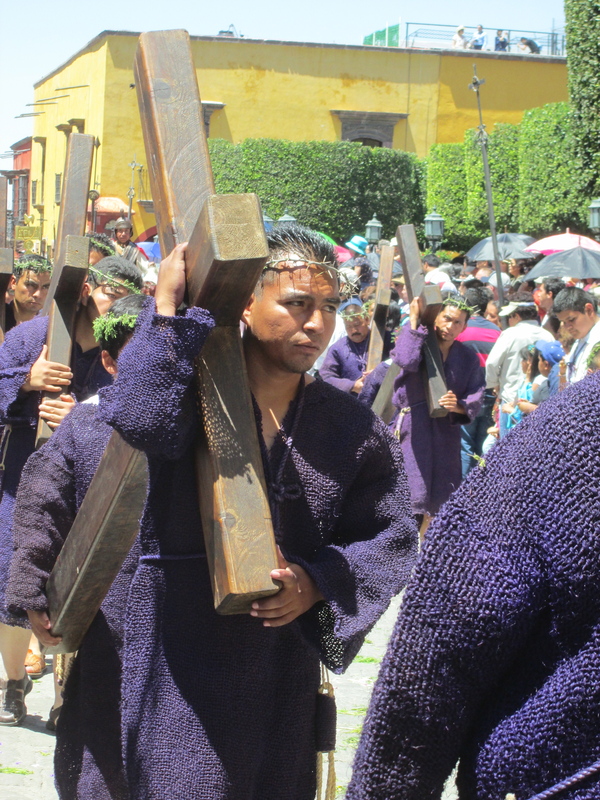 Good Friday, Viernes Santo, features several processions and reenactments and the colors purple and white filled the streets. A moot court reenacts the trial of Jesus, with Pontius Pilate presiding; Roman soldiers on guard on the roof of the church. Then a large procession emerges from the church with hundreds of parishioners taking part: children dressed as angels; barefoot penitents wearing crowns of thorns, and life-size effigies of the main characters. 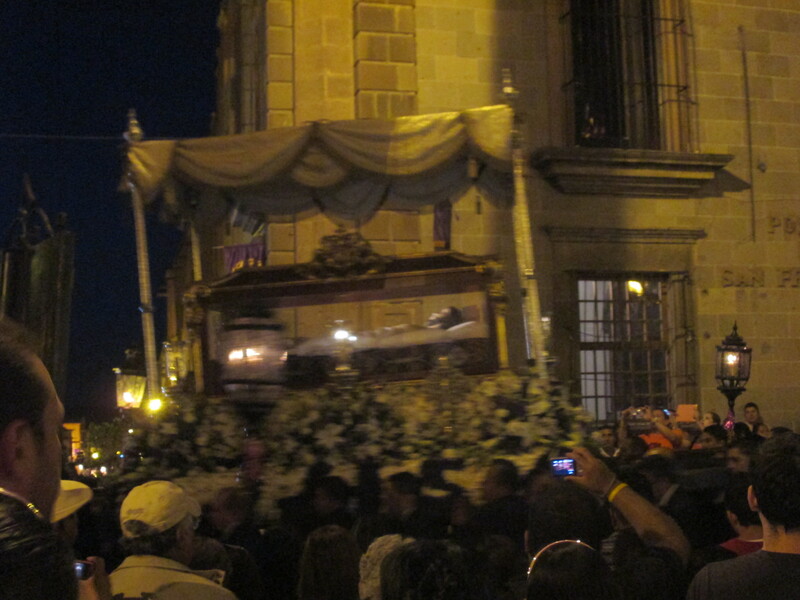 Friday evening I was fortunate enough to witness the longest and most solemn procession, known as the Holy Burial, with more than 1,000 participants, an event that has taken place in San Miguel every year for nearly 300 years. I was accompanied by a family we have come to know from Mexico City who were vacationing in San Miguel; a grandmother, father, mother, and three very impressive daughters, ages 15, 13 and 10. They were very helpful in educating me as to the various aspects of the procession, providing a running commentary. Parenthetically I was surprised to learn from them that there is no such spectacle available in Mexico City, a fact they attributed mostly to the diversity in a city of over 21 million. Illuminated by the setting sun, a crucifix carried by six men led the procession, followed by Roman soldiers representing those that guarded the tomb. Then young girls dressed in white clean the path by throwing chamomile and mastranzo (an aromatic herb) which continue to emit their healing perfume even after being trampled by the many feet of the procession. Five statues of angles are born aloft, and finally a glass catafalque containing a statue of the recumbent body of Jesus followed by priests who walk under a gold and purple canopy. The procession would stop periodically and the priests would pray around the catafalque. As the afternoon light faded and darkness came on, we could hear a choir, accompanied by an orchestra, playing music specifically written for this celebration some 300 years ago and sung every year since. 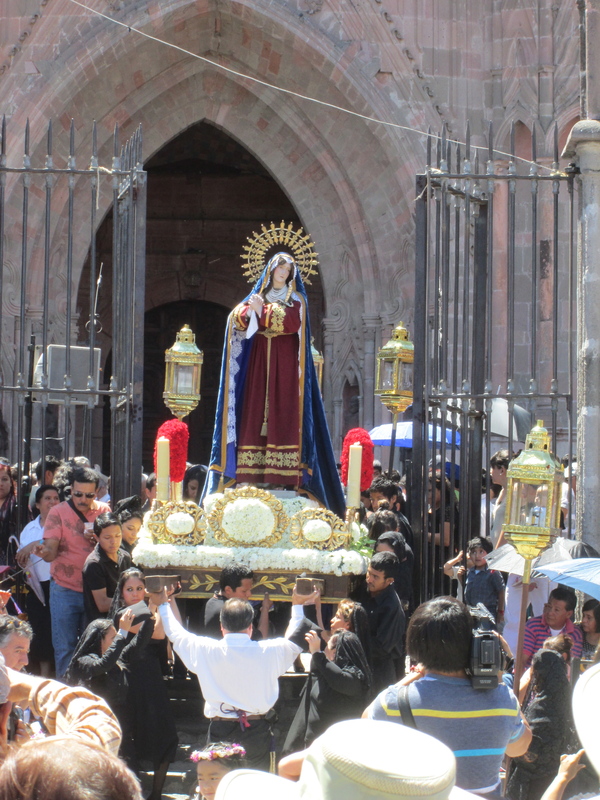 A statue of the Virgin of Solitude is carried by 24 women, dressed in black with lace mantillas, followed by St. John, the only apostle who accompanied Jesus to the cross, and Mary Magdalene. The procession ends with statues of the two men who helped take Jesus down from the cross, Nicodemus and Joseph of Arimathea. In the case of the glass catafalque, it took 40 men (20 on each side) to carry the load. I later learned that the honor of carrying any of the statues is passed down through the generations, from father to son, from mother to daughter. When the procession concluded the 15 year old daughter with whom I was with turned to me and uttered the understatement of the day: “We take our Easter very seriously.” And then at midnight all the church bells rang for over 10 minutes as fireworks exploded. He is risen. Holy Week ends, of course, on Easter Sunday with many Masses celebrated in every church, seven in the Parroquia alone. And finally the “Burning of the Judases” begins at noon when life-size effigies made of papier mache are strung from wires in front of the garden. Originally a teaching tool to help the missionaries explain the betrayal of the apostle Judas, the event has become more politizised and the effigies now also include public figures as well as popular cartoon characters, all of whom are exploded, one by one. So there you have it: the last holiday description from a year of holidays. In spite of all these occasions, normal life proceeds as well and February was full to brimming with great reunions. Our friends of 20 years, Bill and Carmelita, were here for a fun-filled week with much laughter, great dining and one trip out of town; first to Nirvana, a inn and restaurant on a lovely hillside, and then on to the Shrine of Atotonilco. A UNESCO World Heritage site, Atotonilco is known as the “Sistine Chapel of Mexico” and the interior is covered with paintings, poems and inscriptions. The paintings are murals, not frescos, and the paint is tempera. We enjoyed their visit enormously and did lots of things but the best part was sitting around talking, laughing, remembering. Ah, the joy of friendship that survives distance, that picks up where it left off with nary a missing beat. My visa required me to leave Mexico before the end of March and so it was that I flew once again from Leon to Tijuana where I crossed the border into San Diego for a few brief days at my brother’s home on Point Loma. Spent an entire day shopping and managed another small dinner party with my sister and dear friend Virginia. Each time I cross the border on foot I learn new “tricks” about how to speed up the process and this time was no exception. Upon my return we celebrated St. Patrick’s day at our favorite restaurant, Calenda, where we dined on corned beef and cabbage and were entertained by fabulous musicians including a great bagpiper. Wow! You take in so much and you indicate that there is much more to come. I truly admire your delving into the culture and being able to write so well about it. It is a joy to read. You are in the right place and San Miguel is lucky to have you. We look forward to your future blogs, and hope that you continue to enjoy your “new” home in San Miguel! Our best to Michael, too. Hello Lynne. Thank you for a beautiful and enriching post.